The late English director Alan Clarke’s 1987 film Rita, Sue and Bob Too presents potentially unsettling material in a surprisingly light manner. Boutique label Twilight Time has made this cult favorite available on Blu-ray as part of their Limited Edition series (only 3,000 copies available, visit Screen Archives for ordering info). The film centers on a pair of high school friends, Rita (Siobhan Finneran, Downton Abbey) and Sue (Michelle Holmes), and their initially carefree affair with married father Bob (George Costigan). Rita and Sue live in council houses, while Bob enjoys a somewhat more posh lifestyle in a nice suburb. Bob is a manipulative user, taking advantage of the willing schoolgirls because his wife Michelle (Lesley Sharp) won’t put out. Rita and Sue appear to be 18-ish and neither is as innocent as they let on, but they of course deserve better treatment. Bob is clearly a hedonist who willingly jeopardizes his home life for these regular hook ups. Eventually things get a bit tangled as Michelle discovers her husband’s cheating. Sue eventually begins dating the ill-tempered Aslam (Kulvinder Ghir). Neither girl has much in the way of positive influences in their lives, something Bob uses to his advantage. For better or worse, Bob adopts a rather instinctive attitude regarding his affairs, not considering the psychological impact he’s having on Rita and Sue (especially when he drives a wedge in their friendship by favoring one over the other). The acting is irresistibly natural, with Finneran, Holmes, and Costigan believably inhabiting their roles. The former two perfectly capture the coarse and crass immaturity of Rita and Sue. An encounter with Bob in a pasture centers on the cow pies littering the landscape; the girls seem oblivious that talk of manure isn’t exactly complementary to an impending sexual tryst. The whole bit almost feels improvised (which can be said for many of the film’s best moments). Late screenwriter Andrea Dunbar lived a hardscrabble life that probably contributed to the authenticity of the characters, situations, and dialogue. Not the most aesthetically pleasing film to begin with, Twilight Time’s Blu-ray presentation of Rita, Sue and Bob Too is acceptable. It’s a clean transfer, but the image is on the soft side at times. This may be the fault of the original cinematography as the film was apparently fairly low budget. The DTS-HD MA mono soundtrack is perfectly free of distortion or other technical problems. Film scholars Nick Redman and Julie Kirgo contribute an informative commentary track that serves as the primary special feature. As is generally standard of all Twilight Time releases, an isolated score track (Michael Kamen wrote the music) is available as well. In addition to her commentary, Julie Kirgo wrote another of her thoughtful essays for the booklet. 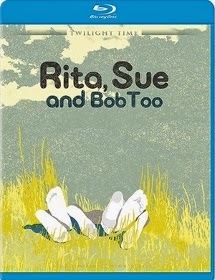 Rita, Sue and Bob Too is another highly recommended entry in Twilight Time’s Limited Edition Blu-ray series.